The indigenous Woodland tribes of the upper Northeast had a tradition of carving “belt cups” or later “canoe cups”. These cups were used for hunting or fishing and were attached to a sash or belt by a leather thong. 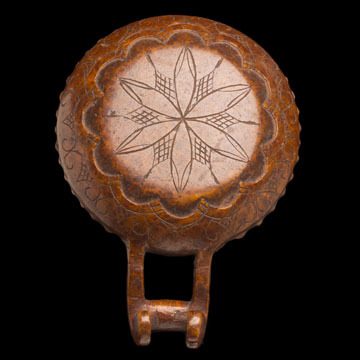 This large example (likely Micmac or Penobscot), has notched sides and its back is intricately decorated with a complex curvilinear design. This tracery is referred to as a double curve motif and is found on dress and crafts throughout the Northeastern Algonquian tribes.